On Base. From Hwy 77 into Kingsville, exit on Angle Rd. or General Cavasoz and proceed approximately 1-mile to the east to entry gate. Then proceed east to the first stop sign and then turn left on Nimitz Ave. 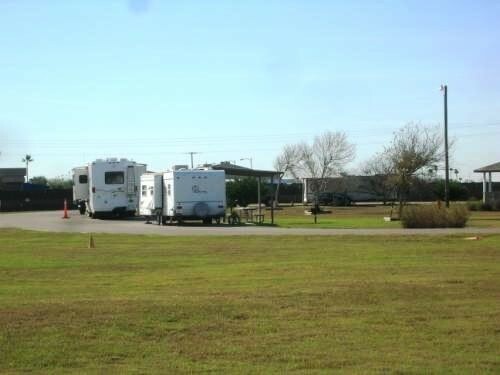 Proceed past the Exchange, Commissary and Club that will be on the left – then watch for Auto Hobby Shop/Outdoor Recreation/RV Park on the left. 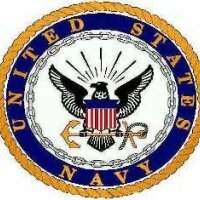 For Extended Stay (1-6 months), Active Duty: 21-days in advance/Retirees: 14 days in advance. Wi-fi available in the park. If requested, a forwarding address will be provided. Packages by the popular carriers are delivered to your site. Pets allowed with usual leash and clean-up rules. Maximum stay of 6-months / 20 sites (extended stay 1-6 months), 5 sites (short term stay 1-30 days). All of the extended stay sites require the RV to be parked so the hookups are on the wrong side. This usually requires extra length for hoses and electric chord. There is no exception to this policy. Slightly remote campground, but a great deal. This place hasn't been reviewed in a while so ill do it. Staff is friendly enough but not enough to make up for the atrocious condition of the sites. As mentioned earlier the layout is just beyond description, it makes no sense at all to have your hookups and parking pad 2 feet from your neighbors covered picnick table that is 25 feet from his front door. 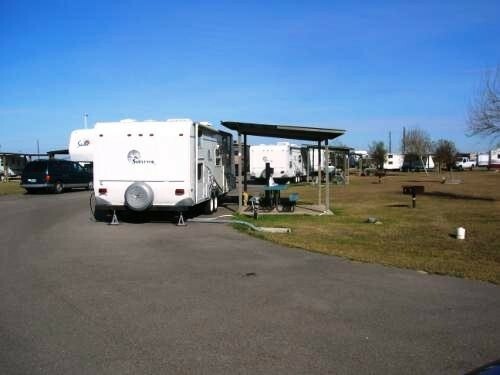 Imagine a campground where you used your neighbors pad and the guy on the other side of you used yours? You are trying to cook and eat right beside your neighbor who is sitting watching tv in his camper 2 feet away from you. The road to the pullthru spots are mud ditches and your lucky is you can park on grass as most of the pad is swamp. This being said keep in mind most of the residents are semi perminate and glad to have this place I'm sure. This place is the same price as corpus and it isn't even in the same league. I will stay here only out of necessity and only is I can get a spot on the road that is the main loop of this park. This park is old and in bad shape. Most of the people parked here are permanent types. Some have been here for years! As many as five years I was told! They keep three or four spots open for RV travelers. My 50amp service wasn’t working although the 30amp and 20 had power. The water didn’t work either. I was offered a refund which was forthcoming. There was some talk about 10 more sites being built sometime in 2014. The staff was friendly and apologetic. A electrician showed up the following morning to fix the electrical problem. The roads are narrow asphalt, and there’s a lot of sand that ends up in your motor home. The next time I’m passing through I’ll opt for a commercial park instead. We camped here in a motor home. THIS IS NO MORE THEN TRAILER PARK!!!!! 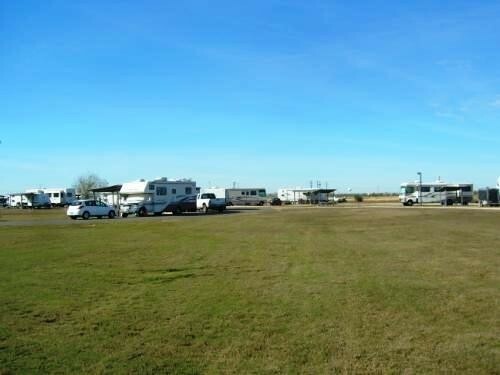 IT LOOKS LIKE THERE ARE MAYBE 4 SPACES THAT ARE AVAILABLE FOR RVs IN TRANSIT. THE RATES HAVE INCREASED, THEY ARE NOW; DAILY;$18.50, WEEKLY;$98.00, MONTHLY;$345.00. 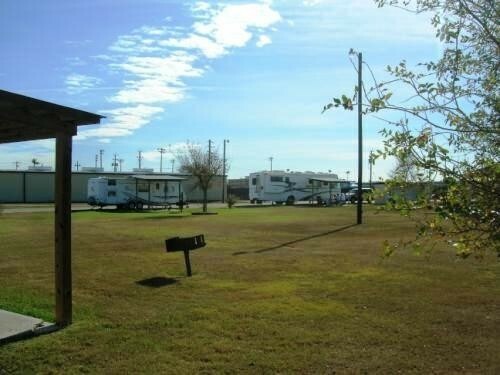 The rv park has improved much over the last visit 12 years ago, BUT! could be so much better if someone with some RV savvy had laid it out. The way it is everything is wrong when it comes to hook up and there is no reason it could not have been laid out the way it should have been, there is plenty of room and very level. I am enjoying my stay here the folks in the outdoor recreation are great. They had nothing to do with the park layout. You will find no cheaper rates then what they have here. 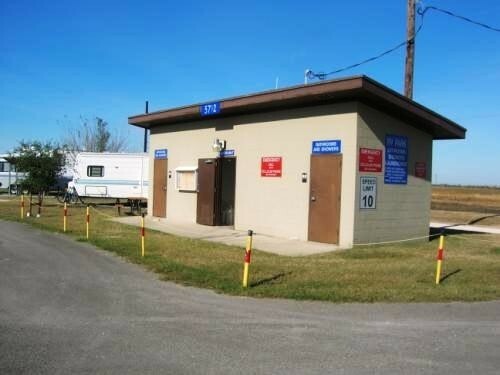 They do have to many site that they are renting out to GI station here as far as I'm concerned. 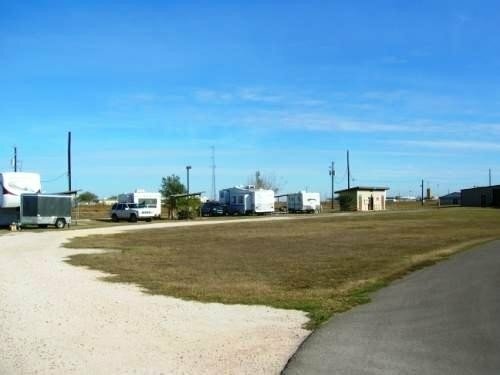 The RV park should be for folks traveling or spending a few months in the area. Here they are trying to make it a paying concern and renting out trailer left over from Hurricane Cantrina to GI's that are station here. That is the purpose of "Trailer Parks" and should not be a part of MWR. All of the sites have going long term (6 months). There are 25 full hook-ups and you can make Reservations-retired 2 months before arrival date. MWR staff they are the best that we have found. I had a medical problem and they worked very hard to help my wife. The hospital in town is small but very good. There is no rec room, or lounge, they have a club but did not use it, bowling ally makes good sandwiches. We will be going back. H.Y. left this review using the Directory software: Very strange parking sites; most long-term folks (and there are quite a few) have chosen to park with their door under the casita/roof which makes their services on the outside of the parallel parking site. The whole base is pretty run down and a bit odd, but the people here are just SO nice it makes up for it. L.H. left this review using the Directory software: Easy in/out. Through the gate, take a left at the "T", about 1/4 mi on your left. Quiet, (some acft noise), peaceful, very secure. Very friendly & helpful staff & others. New, aggressive manager. I am in off-season so I had my pick of sites. Eighteen new sites are being planned to double sites available. There is now a Subway at the NEX. Kingsville is easy to get around. Corpus Christi is only 40 minutes driving time and there is no salt air coating your rig here in Kingsville. If you like seafood, ask about the Kings Inn. Being a full-time RVer & with many places striving to become "destinations", I appreciate having quality famcamps for those on a budget so I will stay here again anytime I am in the area. Side note: I have visited 3 famcamps in the last few months and all are allowing mil permanent party/DOD/Border Patrol more sites for extended stay. Maybe a trend? The new sites are almost complete. They are in the final stages of installing the sewer hook up and paving the roads. It's a bit of a mess now because they had a lot of rain right in the middle of laying down the road sub surface and its muddy. All will be finished soon and it will be quite nice. The parking is strange...you have to parallel park in many. The Commissary and PX are small but adequate. The base gas station is accessible and cheaper than town. Strong Wifi. Free ice. There is a Lowes and Walmart in town and a great Chinese buffet that even includes steaks! Office guys are great and most helpful. For those traveling to/from Mexico, this is a good staging area since Brownsville is only 2 hours away. We'll be back. The MWR rep was very friendly and helpful. 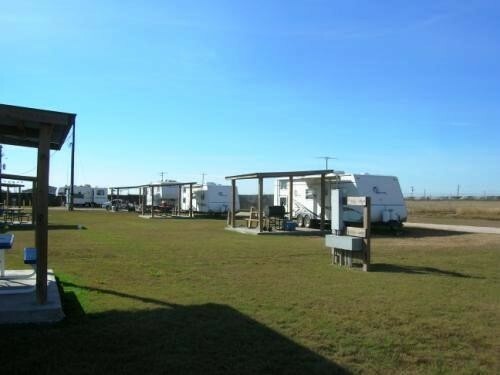 However, they have added new sites with the hookups right by the road, meaning that you have to park your RV on the road to line up with the cabana and hookups. Strangest hookups we have seen in our travels. There was one washer and dryer and two combo bathrooms with showers (all in one). The base looks a bit like a ghost town with the U.S. Border Patrol housing the most residents. Not sure what the future is for NAS Kingsville, but is in need of a "sprucing up". Everything looks run down. They do have a nice NEX and commissary. Only place to eat on base is the bowling alley...Probably won't go back. They are full right now, put us in overflow with water and electric. They now have sewer at all the sites. Yesterday they started laying out 12 new sites. This will double the size of the campground. They also have wifi. 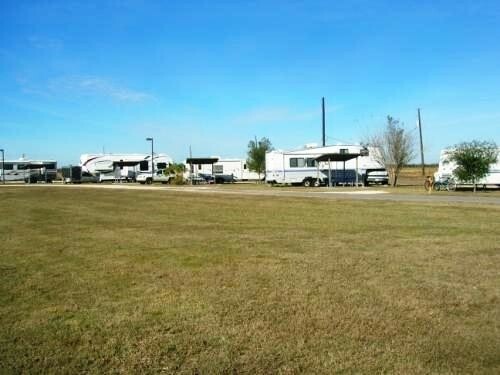 Wife and I have stayed at NAS Kingsville RV Park for the last two winters. If you are looking for out of the way place with peace and security this is it. People are super nice from the Base Commander down. 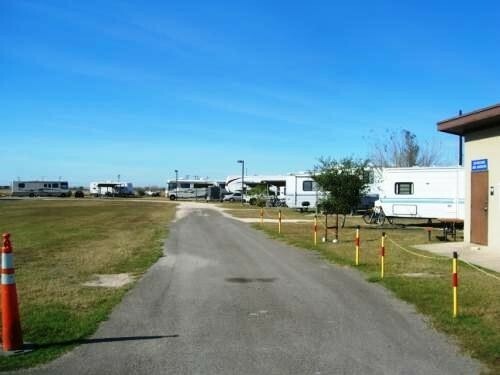 They love their RVers on base. This is a first jet training base for future Naval Aviators so it is noisy. Kingsville (25,000) is only one mile out the gate. There is a small NEX/Comm on base. Bowling alley and all hands club. We love it. Also, all 13 sites now have Sewers/water/ 30 amp and some have 50 amp hook-ups.